You know how on television you sometimes see ads for an organization called Heifer International? If you have ever wondered how it all began, your curiosity will find the answer in this charming picture book about one of the first "seagoing cowboys" at the end of World War II. These are the cowboys who delivered livestock to countries in desperate need to being rebuilding after the war's devastation. By 1945, Poland had been ravaged. Its cities and farmland had been bombed badly, the people who had survived were starving and help is desperately needed. 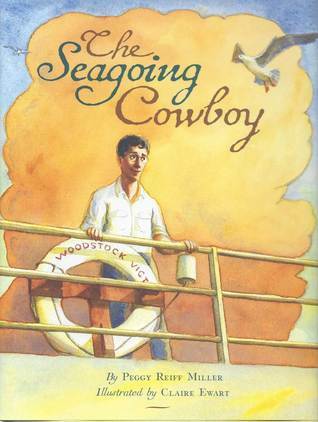 In the United States, a young man who is looking for adventure decides to sign up to become a "seagoing cowboy" along with his friend John. Their adventure begins with a train ride to the city, where they will board their ship, the Woodstock Victory. They arrive just as the horses and heifers are being loaded onto the ship. John is one of the young men assigned to caring for the horses on their week-long journey to Poland, while our un-named narrator cares for the heifers they were bringing over, heifers that will provide milk, cheese and butter to the hungry Polish people. Sailing to Poland isn't an easy journey what with seasickness and a bad storm, but at last they arrive at their destination. The cowboys and their livestock are welcomed with smiles and open arms, especially by the children who want the gum and chocolate the Americans carry (and who can blame them for wanting to things after years of having nothing). And the cowboys are happy to give, but what really leaves a strong impression and saddens them most is the devastation they witness everywhere they go. I have to be honest and say that although I have heard of Heifer International, I had never heard of seagoing cowboys, and of sending livestock to Poland and other European countries hard hit by war, so this picture book was a real eye-opener for me. And I found The Seagoing Cowboy to be a fascinating, reader friendly account of such a little-known part of WWII history. Although it is a work of fiction, it is made compelling because it is based on some photos that were given to Peggy Reiff Miller by her father. The photos belonged to her grandfather who had been a seagoing cowboy and they sparked her curiosity about what it was like for the men who volunteered to do this work. After lots of research and talking to some former seagoing cowboys, Peggy took their stories and wrote about the trip of a composite un-named young man and his adventures in The Seagoing Cowboy. Claire Ewart's full-color watercolor illustrations are bright, light and airy, reflecting the optimism of the seagoing mission while also capturing the full range of emotions felt by humans and animals alike on this voyage. I love the little smile on Queenie, the horse that John's father had donated to the program without telling his son and John and Queenie see each other on the ship for the first time. The Seagoing Cowboy is a wonderful, uplifting story about the men who delivered more than just livestock to those in need, they delivered hope for the future, too. You can discover more about this program in Peggy's Author's Note, along with some photographs she has chosen to share. Be sure to download the extensive Curriculum Guide proved by the author. I am familiar with Heifer International, in fact I even made a donation one year on behalf of my daughter's middle school, but had no idea about this little known part of post WWII history. Fascinating. Thanks so much for sharing. I've donated to Heifer, too. Never gave a thought to how the organization got started.